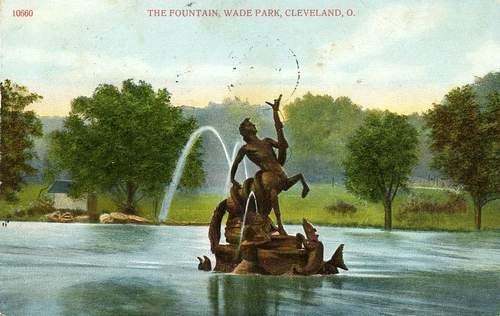 By the end of the 19th c., Wade Park, owned then by the wealthy Jeptha Wade, was a hub of culture and community. 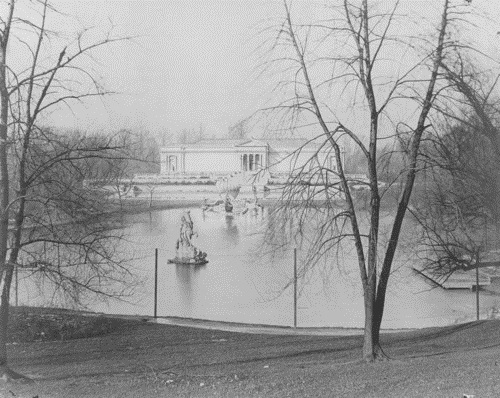 The vast gardens and zoo exhibits that dotted the park brought visitors far and wide. Picnic areas, walking trails, a restaurant, the zoo, and a boathouse on the lovely lagoon kept the park abuzz at all times of the year. 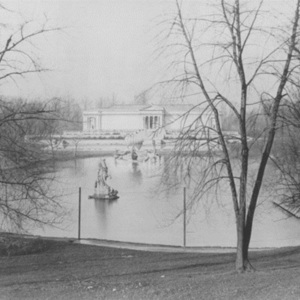 Visitors would canoe on the lagoon in the summer and skate in the winter; a shockingly peaceful contrast in activity to the violent fountain at the center of the lagoon. 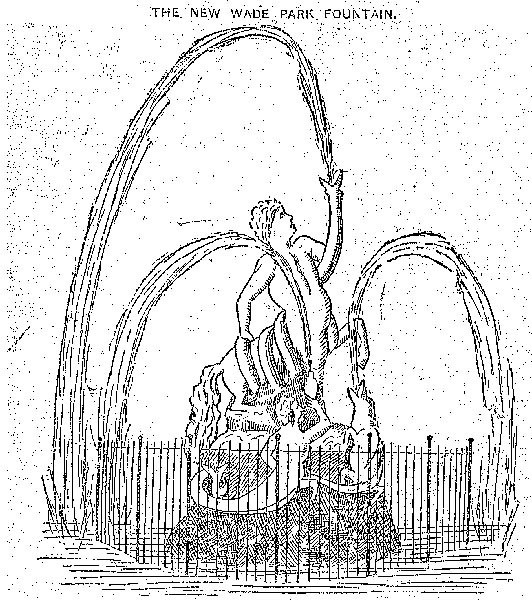 The marble fountain, which cost $1500 to install onto it's $500 base inscribed with the name W. Morse, who oversaw the installation, depicts a bold and brave centaur who has been fatefully lured to a siren's rock by her sweet song. Unfortunately for him, as soon as he climbed atop the rock he was entwined by a wretched serpent. With one hand, he grasps the serpent's neck and squeezes, forcing a jet of mist 50 feet into the air from the it's mouth. From the water on the centaur's proper right, a merman sounds a conch shell in order to draw aid for the centaur, and who should respond but a saurian: a dolphin creature with the ability to kill a sea serpent in one bite! The frantic drama preserved in the sculpture was a definite juxtaposition to the peaceable boating and picnicking that went on around it. 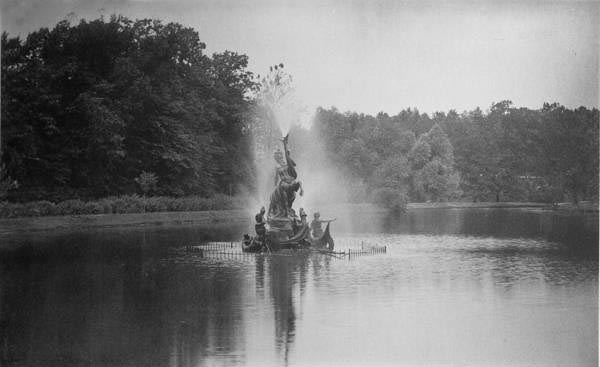 The sculpture is reportedly a duplicate of one that Jeptha Wade saw over the course of his travels in Austria. 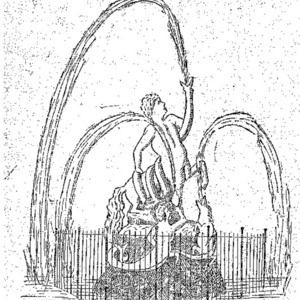 By 1926, the statue had fallen into disrepair and disuse. The growing costs of upkeep and the costs associated with the new art museum precluded any attempts at restoration, and the statue was taken down. 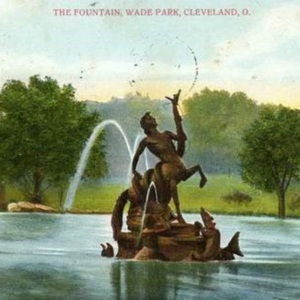 : George Rackle, “Centaur Fountain in Wade Park Lagoon (removed),” Ohio Outdoor Sculpture Inventory, accessed April 22, 2019, http://oosi.sculpturecenter.org/items/show/1501.